“TRUTH, watch out!” Venom shouted as he shot a burst of slime over his comrade's shoulder. This was one of the tougher missions for the Gnomebusters, a team of three dedicated garden gnome eradicators. Truth, Venom, and Di were all locked in battle against several pesky gnomes in Brightvale. Di, the Eyrie, took to the air and shot past the Hissi and Xweetok. He circled the tree before choosing his target and diving. He slammed into the tree with force enough to knock the hats off the confused gnomes. Di didn't hesitate, however, and seized this opportunity to catch the gnomes off guard. With his two powerful claws, he grabbed the frightened villains and then glided safely to the ground. “Good job, Di. The form was excellent!” Venom patted Di on the back before capturing the two wriggling gnomes in a large net. Di and Venom proceeded to place all the unconscious and confused gnomes into the nets while Truth radioed the Gnomebuster Headquarters. With that, the Gnomebuster team headed for Neopia Central, leaving the captured gnomes to be picked up by the cleanup crew. However, back at Gnomebuster Headquarters, the real base commander, Johnson, had been captured and was tied helplessly to his chair, watching his teammates be tricked. After their long journey, the team of three finally arrived at the Money Tree. It was strangely silent. The usual hustle and bustle of Neopets scrambling for the Money Tree's gifts was missing. The Gnomebusters walked carefully around the tree, looking for any sign of the evil gnomes. There was nothing, no gnomes, no Neopets, no gifts. Truth was about to radio Headquarters when the ground beneath the team collapsed. The three pets fell down through the trap door and into a cage. With a slam, the trap door closed above them and the room plunged into darkness. The trapped team sat silently, waiting for their eyes to adjust. As they sat there, they realized they weren't alone. They heard muffled whimpers and a far off cackling. As their eyes adjusted, they saw several other cages filled with captured Neopets like themselves. Venom was about to shout to the other cages when a bright blue light filled the room. The light was emanating from a ghostly figure hovering in the middle of the room. During the Pant Devil's monologue, Venom loaded his slime gun and took aim at the evil-doer. But before he could shoot, there was a flash of blue and the team was left unarmed. “What are you going to do with us,” asked Venom bravely. With that he vanished. The three Gnomebusters huddled together to discuss their predicament. “We've gotta get out of here,” announced Di. “Well, we're not gonna be able to escape on our own,” answered Venom. “True, but who's going to help us,” asked Truth. “I know of someone,” replied Venom with a mischievous look in his eye. Venom whispered his plan to his comrades. They nodded and began to wait for a guard to come by. Before too long, one of the Pant Devil's gnomes waddled by. “I really hope that they don't find my Wand of Supernova. I would be devastated if they stole that,” announced Venom in a too loud voice. The gnome heard this and hurried away, eager to steal the wand and make the Pant Devil happy. After a while, the guard returned looking angry at having found no wand. He made his rounds in the prison room and then left. Out of the shadows came a proud and fierce friend of Venom. It was his petpet, Dreamer the Darigan Ukali. Dreamer flew over to the Gnomebusters' cage and received a pat on the head from Venom. Dreamer nodded and scurried out of the prison room. The team nervously waited for what seemed like an hour until finally all of the cage doors sprung open! The team hurried out of their cage amidst all of the other freed prisoners who were now scrambling for an escape. An alarm began to sound from somewhere. The Gnomebuster team hurried out of the prison room, past a confused group of gnomes, and into a long corridor that was now flashing red and echoing with piercing alarm sounds. Quickly, the three Neopets headed down the hallway and were met by a flustered Dreamer, flying out of a room on the left. Di let Dreamer ride on his back as they made their way into the room. They found themselves in the control room of the Gnomebuster Headquarters. At first glance, all they saw was Commander Johnson the Aisha tied to his chair. Venom slithered over and quickly untied him. This was validated by the thunderous cackling that roared above the tremendous noise of the alarm. The Pant Devil appeared behind Johnson holding one of the stolen slime guns. The Pant Devil then shot a burst of slime at the group. Before it could reach them, however, Dreamer jumped off of Di's back and flew straight into the slime, stopping it before it could reach the Gnomebusters. Wasting no time, Di took to the air while Venom darted towards the Pant Devil. The Pant Devil tried to shoot another burst of slime at Di but missed. Venom reached the Pant Devil and began to wrestle the slime gun out of his hands. Di dove from the air, straight at the Pant Devil and hit him head on, sending him flying across the room. 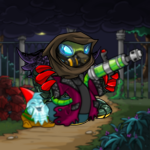 Venom was still holding the slime gun and now lowered it right at the Pant Devil. “We win,” announced Venom coolly as he shot a burst of slime at the evil-doer. The Pant Devil, however, was not there when the slime reached him. The slime harmlessly splattered on the wall behind where the Pant Devil was. “He's gone,” said Truth, shocked. Why, this is easy, I realized. I guess it wasn't necessary to read all of those "learning to swim" books. It comes naturally for Flotsams! "Brightvale is a political tinderbox. Everything has to be able to be moved easily, or else we'd never get anything done." Seven quick tips to avoid cleaning out your wallet for something worth nothing more than pocket change.